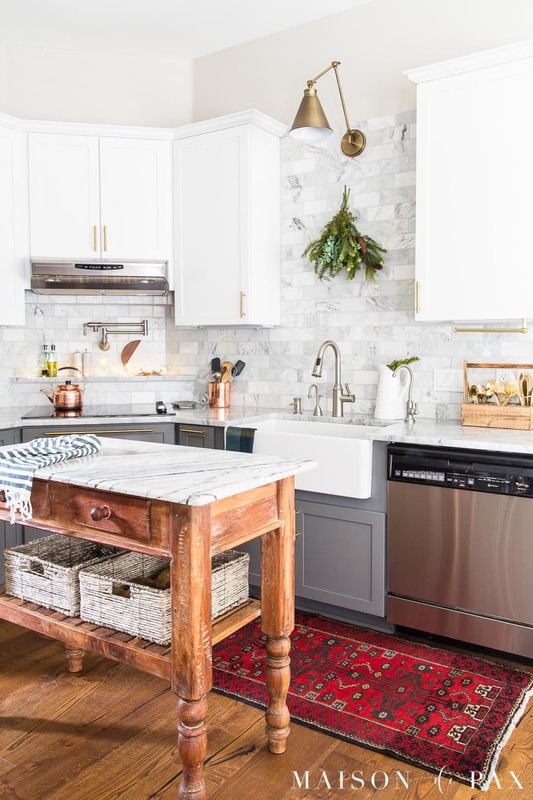 Vintage Persian and Turkish rugs have become increasingly popular as kitchen runners, area rugs, and more. 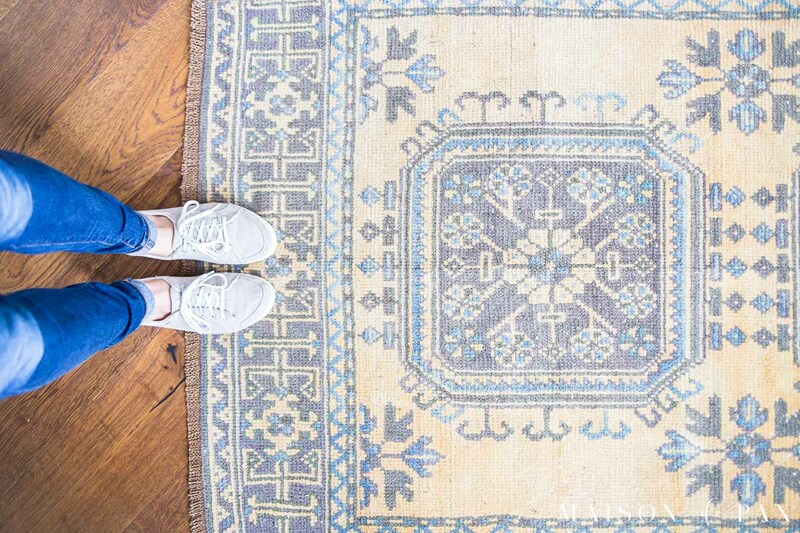 Find out where to buy vintage rugs affordably. If you saw last week’s confession about proving my smart-mouthed younger self wrong, then you know what’s coming: where to buy those vintage rugs I swore I’d never use. 😉 Surprisingly, they’re really quite plentiful. And, contrary to popular opinion, vintage rugs are not necessarily overly delicate nor prohibitively expensive. They certainly can be those things (and my oh my, how beautiful some of them are! 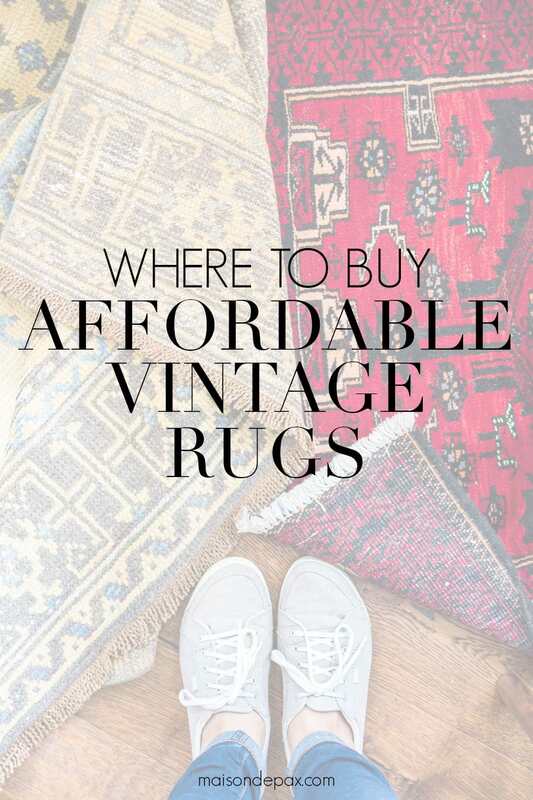 ), but they don’t have to be… I have had a $69 vintage wool Persian rug by my kitchen sink for 2 years, and I can’t think of anything better for the space. 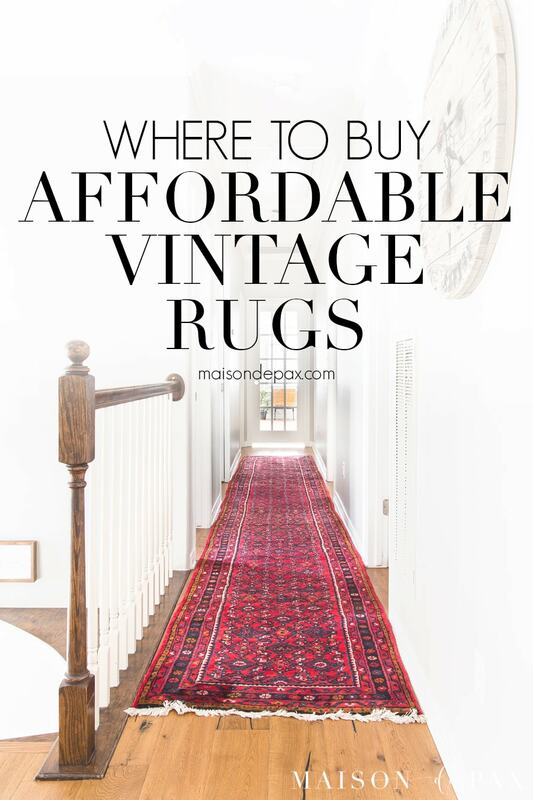 So I’m excited to share with you where to buy vintage rugs affordably. I feel I should start by pointing out that there are some rug companies who are willing to do the curating for you. 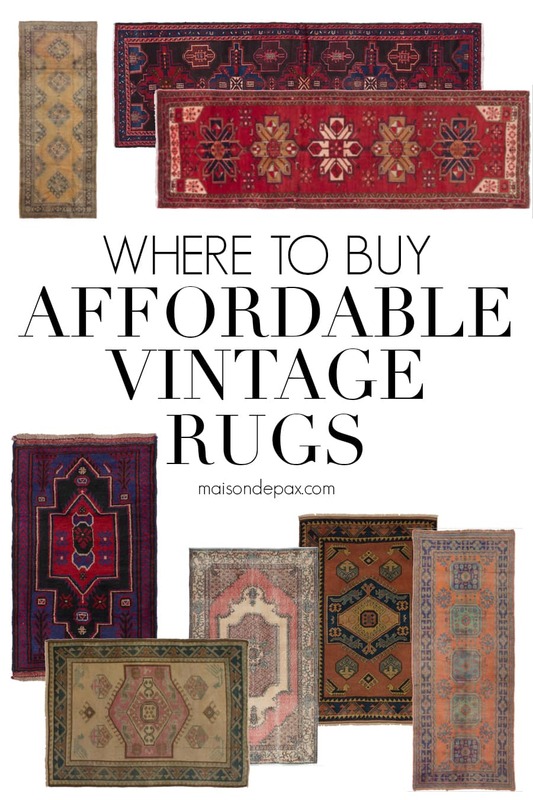 And if budget allows, then Loom + Kiln, Revival Rugs, and Swoon Rugs, among others, have beautiful vintage rug collections. If you’re working on a tight budget, though, I have two particular suggestions for you. As with most things on Ebay, you can buy vintage rugs via auction, at “buy now” prices, and even at “best offer” from time to time. My favorite (because bidding tends to raise my blood pressure) are the buy now or best offer options, but any can work well. Especially if you are looking for a vintage kitchen runner or small bathroom rug, the variety of options on Ebay are amazing. And as you can find some that won’t break the bank, there is no major concern with using them in high traffic areas. I definitely have a favorite rug store for affordable rugs on Ebay called ecarpetgallery, and their prices and selection are truly incredible. They tend to have more of the deep reds and burgundies than the pinks and oranges, but their selection is so good that I keep coming back to them. If you start searching on Ebay, you’ll realize that there are THOUSANDS of vintage rugs for sale (and some modern reproductions that sneak in when you search “vintage rug”)… So you’ll have to narrow down a lot. I start by searching the rough dimensions of the rug I want. For example, I might search “3×8 vintage runner” if I were looking for a runner for my kitchen. Once there, I can limit further by price and I can sort by “newest listed.” This is a great tool when you’ve been searching for a while for just the right rug. You can check in each week looking for “newest listed” and not have to scroll through everything you’ve already seen. You can also try broader categories (like “vintage runner” without the dimensions) in order to find a few good sellers. Which brings me to another tip for buying vintage rugs on Ebay: when you find a seller who has a nice rug and good reviews, visit their store page and look at all their listings. The sellers who have strong access to nice rugs also often have free shipping and returns… Having a seller who is easy to work with is a big plus in my shopping experience. 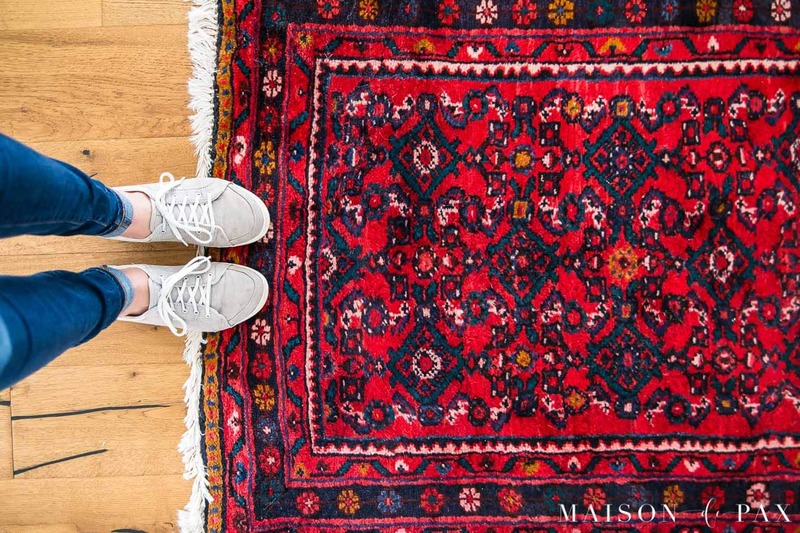 And speaking of free shipping, there are quite a few highly-rated vintage rug sellers who have gorgeous rugs but charge $65 flat fees for shipping. It’s not necessarily a deal breaker, especially when you win a rug auction for a great price, but it is something to bear in mind when calculating your budget: be sure to look at the seller’s shipping cost. Almost all the same principles about shopping for vintage rugs on Ebay apply when shifting to Etsy. One thing I will note, though: for whatever reason, Etsy sellers seem to include the dimensions of the rug in the title of their post much less often than Ebay sellers. Result? It takes longer to browse Etsy’s vintage rugs because you often have to click on the actual product to find out the exact dimensions. Other than that, though, all the same tips apply: search your size or style (this is especially where terms like “Anatolian” or “Heriz” or other regional names can help you narrow your search), find sellers who catch your eye and then check their entire stock, and be sure to check seller ratings and shipping costs. I am always amazed at the speed at which some of the Ebay and Etsy sellers can ship a rug directly to my door. In fact, I purchased a rug from this seller recently, and it was delivered straight from Turkey in just four days! 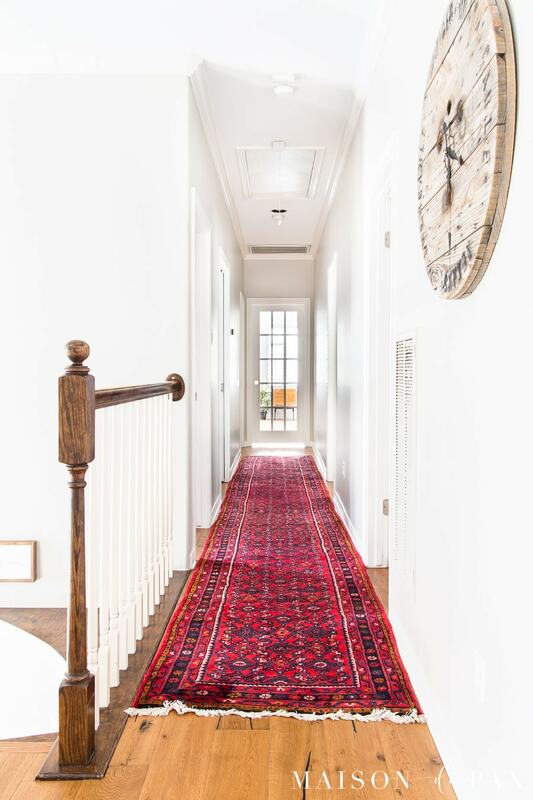 If you are just stepping foot into the world of shopping for vintage rugs, then small rugs to use as doormats, bathmats, kitchen runners, and hallways runners are a great start. You can even layer smaller rugs over larger neutral ones beneath a coffee table or as an accent. I’ve rounded up a few that have caught my eye for you to shop from (and since each of these are one-of-a-kind, forgive me if they sell out sooner than I can replace them!). 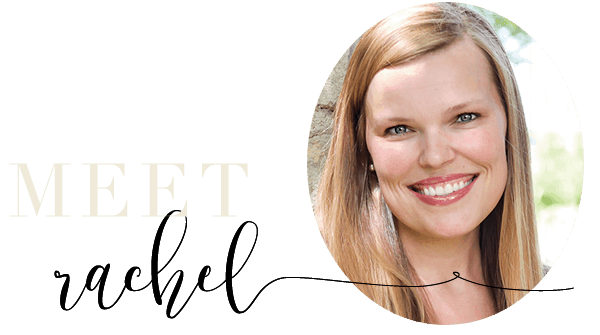 I’m loving this series Rachel! I’m on the hunt for some for our new place and loving all your recommendations. Wohoo! So glad you found it helpful, Lisa! I have also purchased vintage Persian rug on Etsy that shipped direct from Turkey but arrived remarkably quick. The seller I found that I liked was Lalalandrugs. I love that they are one of a kind. I’ve noticed how great they are for hiding dirt (vs cotton rug I have under my kitchen sink). Thanks for the new sources. I can’t wait to check them out. Great post! Great point about dirt, Andrea! And I’ll have to check out that seller, thanks for the suggestion! Thanks Rachel. Really enjoyed your Buying Vintage Rugs 101. Being retired and decorating obsessed, the places to find the best bargains is extremely helpful. Great post! So glad it was helpful for you, Theresa! Love my rugs from BoHo Flourish on Etsy, This seller does have free shipping. I find if I show all the rugs and put my curser over each picture it brings up the measure of that rug so I can more easily narrow my search. I love runners but sadly most are too wide for my halls which are less than three feet wide. Livin’ the dream in a 200+ year old house! Those rugs sound amazing! Glad that you found a great source. Hi, Rachel. This is an extremely helpful (and personally, timely) post! I absolutely love your red runner upstairs. I haven’t had much luck finding floral designs (like yours)- most have been more geometric based designs. By chance, do you have any suggestions to share on searching for these type of rugs? Many thanks for all the information on vintage rugs!!! Hi Kelli, I’m so sorry for the slow reply; this comment got buried somehow! I should admit that it probably took six months of looking before I found the long runner for our hallway. That was probably more due to the unique size I was searching for. I think if you search “persian” or “oriental” you are more likely to find some of the floral patterns. The Turkish rugs in particular seem to be more geometric. I hope this helps in some way!